In my ongoing quest for the next great Double IPA / Imperial IPA I happened upon a wealth of choices over at Korker Liquor in Corona Del Mar. There is so much great beer over there right now, and not nearly enough money in my beer budget this week. So I weighed my options and chose the Double IPA from Hangar 24. Assertive and Drinkable. Double IPA is California’s gift to beer lovers. Our beer is brewed with four distinctly American hops: Centennial, Citra, Columbus and Simcoe, all beautifully balanced by five malts and generous additions of local orange blossom honey. An intense sensory experience – the fresh aroma of citrus, pine and grapefruit with the bold taste of hops and sweet honey. Hangar 24 is based in Redlands, CA, so it’s fairly local, (Southern California), and I’ve seen lots of their beers around in my favorite bottle shops. I’ve enjoyed their Orange Wheat and Columbus IPA already, and have a Chocolate Porter from them in the fridge. So my expectation was high going into this one. As you can see in the photo, it pours a clean golden-yellow color with about a finger-width head that hangs out and doesn’t dissipate too quickly. Up front it has an intense tropical fruit hop aroma complemented by delicate honey sweetness. The first sip was full of powerful hop flavors of grapefruit, citrus and pine. The description of the nose and flavor matched exactly what’s written on the bottle, so I’ll just add that this is another very good Double IPA and one that I’ll buy again and again. The sweetness really works well with the hops and makes this a well-balanced beer. 4 Beer Soaked Caps from me on this one. 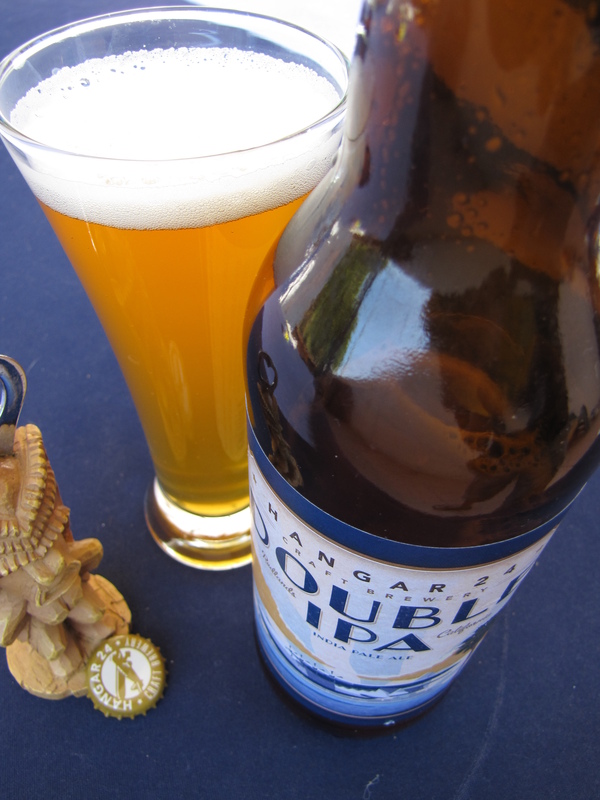 This entry was posted in Double, IPA, Review and tagged Double, Hangar 24, India Pale Ale, IPA by Erik. Bookmark the permalink.